Terroirs, as its name suggests, is at least as much about wine as about food. 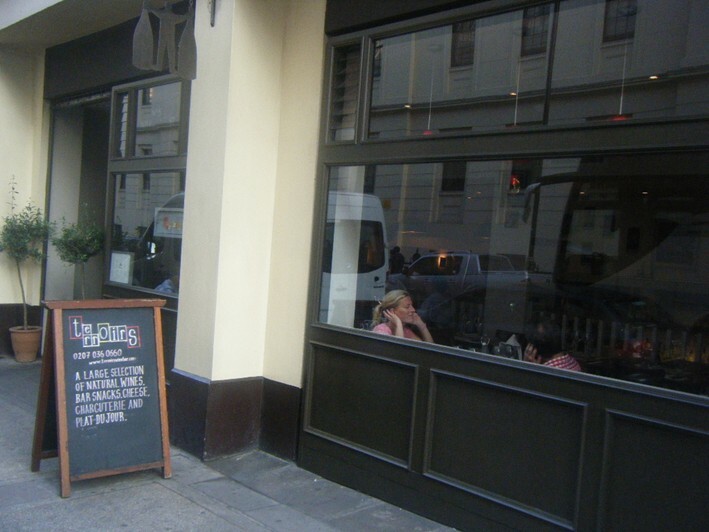 Tucked away in a quiet side street off Trafalgar Square, the dining room is split level, with some tables at ground level and others, and the main bar, a few steps down. The same ownesr have subsequently opened Brawn and Soif. The atmosphere is relaxed, with no tablecloths and an eclectic selection of tables, with chairs that are not designed to linger in. The menu was tapas style French, with a selection of “small plates”, a list of charcuterie, and some main courses. The wine list was strikingly good, mainly French with some coverage of Italy, and concentrating especially on biodynamic producers, many somewhat obscure. The 37 page list had very detailed notes for most wines, and as a bonus is fairly priced. Excellent Albert Mann Riesling 2007 was £25 for a wine that costs just over £10 in the shops. Le Cousin 2007 was £26.80 compared to a retail price of around £8, while the superb Mas de Daumas Gassac was listed at £65 for a wine that will set you back around £30 in the shops if you can find it. The bread was basic bought-in baguette slices, decent but a little out of character given the care in sourcing that seemed apparent elsewhere (11/20). 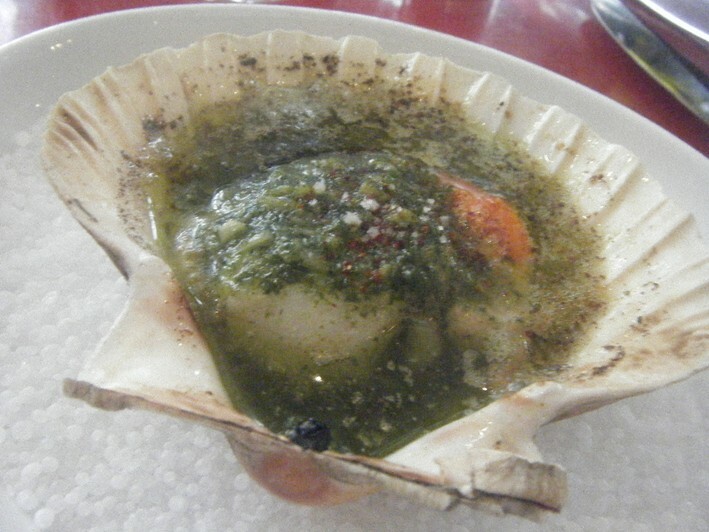 To begin with I tried a single scallop, served in its shell and cooked in garlic butter; the scallop was nicely cooked and the garlic butter did not overwhelm the taste of the scallops (14/20). Smoked eel from Lincolnshire was a curate’s egg of a dish. The celeriac remoulade was excellent, having good texture and just the right amount of horseradish, but the eel itself was fridge-cold, appearing as a rather hard block on top of the remoulade and its smoky eel taste subdued (12/20). Better was a generous bowl of gazpacho, in this case pleasantly not too cold, with croutons, basil leaves and dice courgettes giving some textural contrast (14/20). Quail was served on the bone in a little casserole dish, garnished with gremolata, the meat tender and having good taste, resting in the cooking juices flavoured with rosemary, a little pancetta and a few artichokes. The meat in itself was very good (14/20), but the dish would have been better with some vegetables, which are not available even as extras. Salt cod brandade was well-made, served with a soft-boiled egg, green beans, tomato and a piece of slightly charred toast (14/20). For dessert, apricot and almond cake was excellent, the pastry just a little hard but the filling excellent (15/20), while crepe with wild cherries had a nice pancake but suffered from the crème patisierre filling being too liquid and a little insipid; the cherries themselves were fine (13/20). Service was friendly, and when I asked for some advice about the wine I was considering I was steered to a significantly cheaper (and excellent) recommendation, which is what you might hope would happen in a good restaurant but rarely does. The place was packed out on this Tuesday evening, which is a testament to its success just a few months after opening.